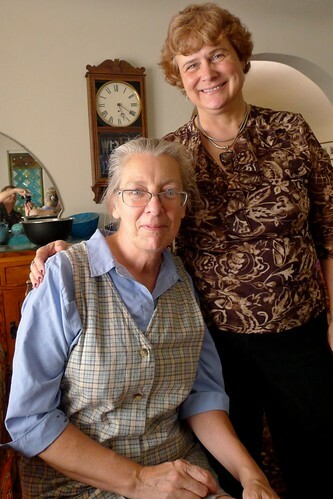 Theresa Halula and I have been friends since our early twenties – some time ago (ahem). 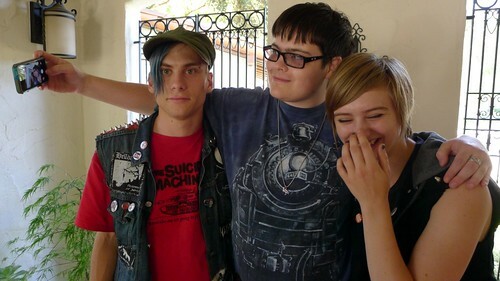 We worked together at Sun Microsystems and our kids have grown up together. We are both dedicated gardeners – and Theresa has a second (third?) career as a certified horticulturalist. It was a delight for Theresa, Dan, Thomas, and Clara to be part of my son Paul’s college graduation celebration this weekend. TiE SV MentorConnect platform, powered by MentorCloud, is an online extension to TiE’s signature mentorship programs that already happen at each of its global chapters. The platform facilitates entrepreneurs to seek and connect with suitable TiE Charter Members as mentors, schedule face-to-face meetings at TiE chapter offices or at mutually convenient locations, and build on that relationship by having ongoing conversations online with each other. Entrepreneurs and Mentors can also form roundtables and have ongoing group conversations on topics of their expertise and interest. 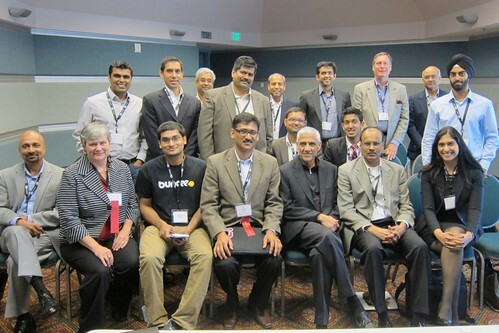 Part of the MentorConnect program at TiEcon is a speed mentoring at lunch, today including two VIP mentors: Vinod Khosla and Kanwal Rekhi. These mentoring sessions were fully booked three days ago – we have waiting lists but conference attendees are still asking to join! 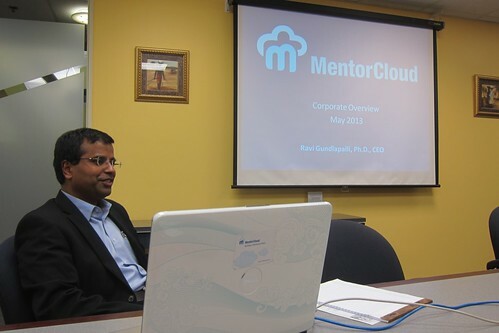 Since I had worked with Vinod at Sun Microsystems, I managed his mentoring session today. 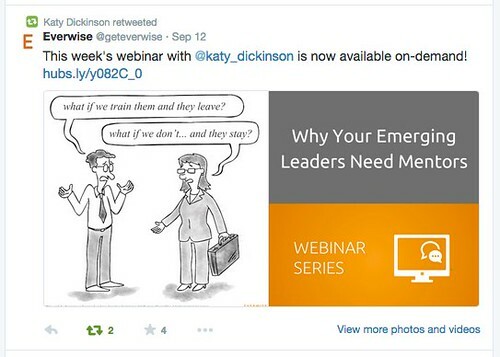 You can see some of my mentoring session notes on my twitter feed. 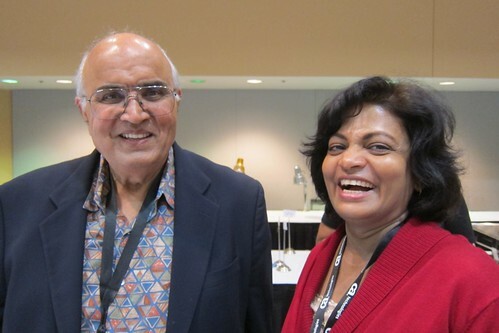 Radhika Padmanabhan managed the session for Kanwal Rekhi. The forty lucky mentees were very enthusiastic about their discussions with these two remarkable men. 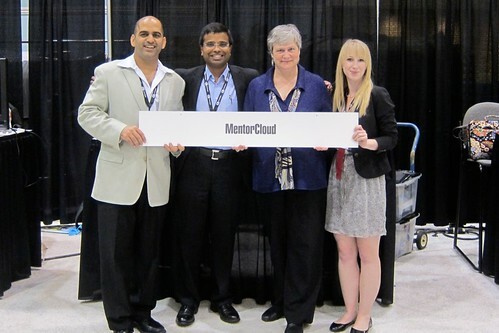 More pictures are on MentorCloud at TiEcon: MentorConnect. Radia Perlman (pictured above at a 2012 IEEE meeting) is a good mentor, and has been a role model, and hero to many for her remarkable contributions to network design and standardization. She was one of the six highlighted in “Award-winning Career Timelines in Computer Science and Engineering” web resource my ABI Advisory Board committee published in 2010. All of the six profiled (Frances Allen, Helen Greiner, Mary Jane Irwin, Radia Perlman, Lucy Sanders, Jeanette Wing) are remarkable role models. 2013 ACM Turing Award Winners Shafi Goldwasser and Silvio Micali for their pioneering work in the fields of cryptography and complexity theory. The Turing Award is the Nobel Prize of computing – given each year for major contributions of lasting importance to computing. Shafi Goldwasser and the six listed above are in the Famous Women in Computer Science web resource. 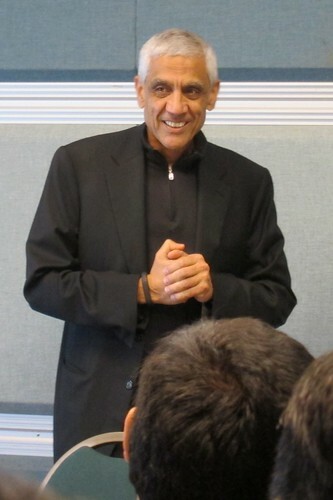 Vinod Khosla for being a Silicon Valley icon, co-founder and employee #1 of Sun Microsystems, co-founder of TiE and other game-changing organizations. I worked for Vinod many years ago at Sun and continue to follow his career with admiration. While thinking of these high-profile technical stars, whose fame is so well deserved, I came across the quieter but deeply impressive story of Dorothy of Camaroon who was given a modest Systers Pass-It-On award in 2010. Rita Thissen sent out an update to the Systers community last week about what Dorothy had accomplished so far with her award funding. I first noticed the story because Cameroon is one of the new Sub-Saharan Africa countries included in the 2013 TechWomen mentoring program. I consider Dorothy both a hero and a role model. What can one woman do to make a difference? Dorothy lives in Bamenda, in the Northwest Region of Cameroon. In 2010 she applied for and received one of the Anita Borg Institute’s “Pass-It-On” awards, a program founded and funded by an international group of women and dedicated to assisting other women to advance in computing. Dorothy asked for help to buy computers and supplies so that she could run a small educational office, teaching computing skills to young women who lacked family ties or any hope of advancement on their own. As a bit of context, there is extremely high unemployment in Cameroon. Many people do all right by growing their own food, building their own houses from handmade bricks, and selling food or services (like sewing) to others in their own town. The educational system and literacy rate are good, but once out of school, people find themselves back selling things in the marketplace again unless they have a skill that is in demand. Teaching, government positions, and lately some kinds of office work are the best jobs available. Dorothy will use the award to fund the tuition for two orphan girls to attend computer courses for six months at a computer training facility and then provide them with a six-month internship at a documentation center owned by a not-for-profit organization. Both girls will be given a computer and printer as compensation for their six-month internship at the documentation center. These girls will pass it on by training at least one underprivileged girl in the future. Three years later, Dorothy reports that she has successfully taught her first group, and one of the students has started work in a money-transfer organization. The computer literacy this young woman achieved under Dorothy’s tutelage made her employment possible. Each of Dorothy’s students also promises to “pass along” the gift of learning to one or more other women who are in need of a helping hand. In this way, a small amount of help can make a real difference in many people’s lives. Many companies are starting to move from informal mentoring that relies on individual initiative to more formal programs. When taken seriously, these formal mentorship/sponsorship programs can be remarkably successful. One of the sometimes-unexpected successes of formal mentoring programs is the development of a strong long-term community of mentors and mentees who have come to know and respect each other through the program. These communities can continue far beyond the boundaries of the company or program that created them. I have written frequently about the Sun Microsystems mentoring programs participated in by over 7,000 employees from 1996-2009. Over 630 of those who joined my Sun Engineering mentoring program (SEED) chose to join a private LinkedIn group to stay in communication after Sun was purchased by Oracle in 2009. I am sure more continue to work and learn with each other through through professional and private connections. 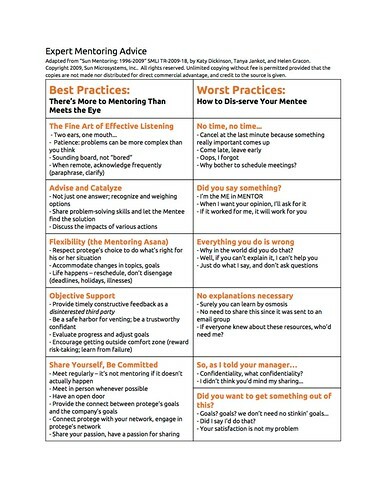 The initial match between one mentor and one mentee quickly becomes the base for more complex and lasting relationships: the mentor introduces the mentee to associates or recommends him for a position, the mentee becomes a mentor herself and introduces her new mentee to her own mentor, etc. In 2010-2011, when I was the Process Architect for the U.S. State Department’s TechWomen mentoring program, many of the potential mentors I contacted to join the new program were former Sun mentoring program participants. 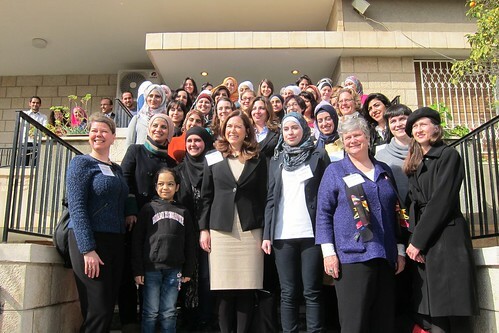 In July 2011, toward the end of the first TechWomen term, I wrote a Katysblog entry called “37 Sisters – TechWomen“. That feeling of family, of a strong and growing US-MENA-based sisterhood, has only increased since then. 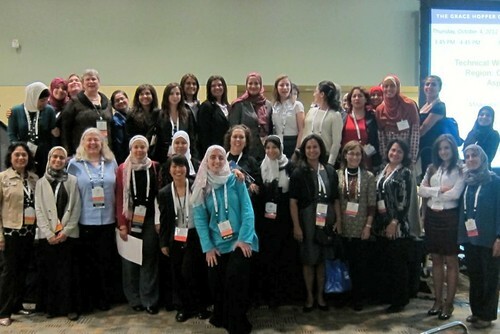 The photo above was taken after our Successful Panel at the October, 2012 Grace Hopper Conference in Baltimore, Maryland, when several dozen TechWomen mentors, mentees, and staff from the 2011 and 2012 terms met to celebrate. Fifty of us gathered again in February 2013 to join the TechWomen delegation to Jordan. The photo below shows us at Injaz, one of the many schools and programs we visited in Jordan to talk with local girls and young women about STEM, TechWomen, and TechGirls. The worlds of STEM and the Silicon Valley in particular are small places. Even though there are over seven million people in the San Francisco Bay Area, after a few years working here, it becomes hard to to go anywhere without meeting folks you know. Professional trust and connections, such as those built and supported by formal mentoring programs, enhance both reputation and effectiveness.